During the welcome reception, the president of ZCCA Mr. Dai introduced how well the chamber has developed. 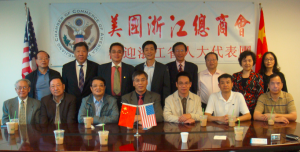 At the same time, the speaker of the representatives showed the positive view toward the development, influence, and contribution of ZCCA over Sino-American trade. This reception was a good beginning for ZCCA and Zhejiang Representatives of the NPC to start a relationship. They had a nice feast after the reception.